Contracts are needed when you don't trust the other party to keep their word. If everyone was honest in their transactions and did what they promised, we wouldn't need lawyers to document every single term, party and deliverable. Since that is not the case, we get a lawyer, write it all down and sign our commitment to honor the terms. But what do you do when the other party keeps changing the terms of the agreement after you have signed? That seems to be the case with Common Core. The language on their website is more fluid than the Mississippi River in April. Blogger Paul Bogush put together a little slideshow presentation called Terms of Abuse documenting these changes. Progressives like their documents to live and breathe. Why should we expect anything different from Common Core? I think we need to be careful about throwing the word "progressive" around. In education it means one thing...I guess I would be about as "progressive" as they come. Using the word to describe one's politics is also iffy (I like to call myself a progressive libertarian!). Around here it is the Democratic governor pushing through the edreforms, but it is also seen as a fight against conservatives, as it is the Republicans who brought this to us and big business interests who are hellbent on taking away our educational freedom. It's just that this movement to take away our education freedom is led by very smart people...it has gotten this far without letting us see clearly an identifiable head to cut off. I think there are issues that both the left and right can agree on and we need to be careful to not alienate one group. Maybe just a simple GWB "you're either with us, or against us," and leave political leanings out of it :) That is where I am right now with teachers. I believe there are a number of people who recognize the term progressive, as in Woodrow Wilson progressive and they know progressive are in both parties. 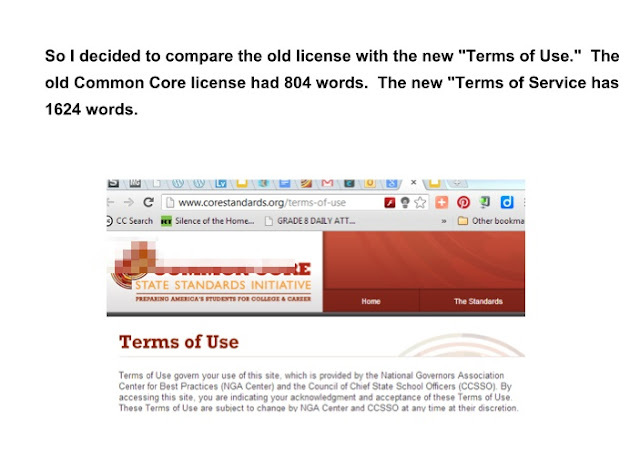 Common Core is an issue that easily crosses party lines (see http://www.democratsagainstunagenda21.com/1/post/2013/03/agenda-21-common-core-is-institutionalized-terrorism.html) and even liberal/conservative lines. I have no problem alienating true progressives who believe in big government run by elite administrators who know better than the little people. They think they are smart enough to change the terms and the rest of us won't recognize how they have changed the game.